Gibson’s mission is to better the lives of students by providing exemplary educational consulting and research services that make educational systems more efficient and effective. Gibson addresses virtually any academic, operational, program, or administrative need you face in public education by offering a wide range of consulting and research services that improve the efficiency, effectiveness, compliance, and decision-making in educational systems. We help school systems improve efficiency by finding out what’s going on behind the numbers. Our goal is to present an objective angle on the effectiveness of an education program. With research that is driven by data, we uncover information essential to actionable decisions. Budget cuts are a distressing solution that often force school districts to sacrifice the quality and effectiveness of their services. Gibson won’t recommend cuts, as we believe the answer to budget blues exist in improving the school district’s efficiency. A budget breakdown shows you how a school system uses available funds, but those numbers don’t prove why money is being spent that way. Therefore, our analyses and recommendations target ways to create better quality of services and savings which result in more efficient and effective use of the available budget. Comparisons to industry standards and established benchmarks support the assessment of efficiency and effectiveness, as well as an internal analysis of processes and information systems. The results provide actionable recommendations and include implementation strategies that improve the management and efficiency of the organization. An efficiency review takes a snapshot of your school system and identifies opportunities for cost savings and other benefits. Efficiency reviews involve analysis of massive amounts of data, extensive interviews, focus groups and observations, and often surveys and community engagement. Our analysis looks at the technical dynamics of organization structure, governance, and policy framework within schools. A school district’s organization chart is perhaps the most important visual representation of accountability in a school system, and a misaligned organization structure can wreak havoc. If functions are not logically aligned, then it is often difficult to find leadership positions that can effectively oversee these functions. Organization structures define the chain of command in an organization, but in doing so often limit needed communication to ensure the organization’s success. Our organizational analysis services evaluate the logical alignment of functions, determine adequate spans of control (number of people reporting to a boss), and analyze the flow of information up, down and across the organization to make sure each leader has the information they need to support good decisions, strong performance, and accountability. In addition to the technical dynamics of an organizational analysis, there are obvious people dynamics. A strong organization structure should survive changes in leadership, but people issues need to be considered when migrating from the existing structure to a new structure. We can help you plan this transition. Academic expectations for students continue to increase, and in some cases special populations are struggling to keep up. Gibson can review your programs for special populations to help ensure the right students are getting identified for program participation, that academic rigor is present, that the program is in compliance with applicable laws, regulations, and policies, and that it is operating efficiently and effectively. Our work includes extensive data analysis from multiple sources, including student, financial and staffing data, interviews and focus groups, and classroom observations. We also conduct longitudinal analysis of student outcomes (with the help of our research and evaluation unit) to identify even richer findings. Our project team also includes alliance partners who are veteran experts in Special Education, Bilingual / ESL education, and gifted programs. Most states have rigorous accountability systems for student achievement; few have similar systems for operational efficiency and effectiveness. That’s where we come in. One of the most important goals of our efficiency practice is to help our school system clients “internalize” the efficiency and performance measurement disciplines we introduce during our snapshot efficiency review. Districts who can do this won’t need consultants to come in and take efficiency snapshots – they can do it themselves. We maintain a list of over 150 operational efficiency and performance measures to select from, such as electricity cost per square foot, transportation cost per student rider, and the ratio of laptops to technical support staff. Then we define the data elements, the source of the data, the person responsible for data accuracy, and the means through which to collect the data. We provide benchmarks and industry standards for comparisons, and help investigate the causes of unfavorable variances – and coach department heads on how to do all of this going forward on their own. We can also create data visualization tools to support a more user-friendly view of performance. Enterprise Resource Planning (ERP) systems represent the core information systems of a school district: Finance, Human Resources, and Student Information. Selection of a vendor is a daunting task, but this pales in comparison to the actual conversion to a new system. But here’s the problem…we haven’t re-engineered our processes to take advantage of the new technology. We’re still doing a lot of things the way we used to – with paper, with spreadsheets, even with post-it notes. Why does this happen and how can it be prevented? Gibson can help make sure you get the right ERP system, by helping you define requirements, prioritizing those requirements, and implementing a very structured, controlled, and defensible bidding and evaluation process. Perhaps more importantly, Gibson can help identify ways to ensure that future processes are more efficient than the old ones, and that the use of technology can be maximized. Policies and business rules can also be examined to simplify the ERP requirements, reducing if not eliminating the need for expensive ERP customization and maintenance. Automation is an important element in achieving efficiency – and we want to help you do it right. Grand Prairie Independent School District, a Dallas suburban district with 30,000 students, engaged Gibson to conduct a targeted efficiency study in an effort to identify cost savings opportunities. Gibson analyzed multiple years of data and conducted interviews with Grand Prairie Independent School District’s management. going forward. This project identified efficiency and qualitative performance measures for all non-instructional functions. We created a data visualization tool for displaying the performance measures and for enhancing the analysis and reporting of the measures. The district implemented all of Gibson’s recommendations and used a portion of the savings to underwrite the investment in performance-based budgeting. Gibson conducted a special education review for Katy ISD, a suburban district outside of Houston with approximately 70,000 students. The project focused on program organization and management/school support, information systems and processes, staffing, and Katy ISD’s behavior program. The study involved extensive analysis of data, interviews, focus groups, and school site visits. This review resulted in several recommendations for improvement to fill service gaps, improve the use of automation and provide transactional relief for special education program leaders. Austin ISD, one of the largest urban districts in Texas, hired Gibson to conduct an executive level organizational study to better align its functions and establish appropriate spans of control. We conducted 52 interviews, six focus groups, and a series of surveys. We also reviewed relevant documents provided by the district. The project resulted in $1 million in annual savings, as well as other recommendations to improve planning and accountability. Since this project, Gibson has performed additional organizational analysis work for a new superintendent and worked with the district to identify potential areas for cost savings. Gibson was contracted by the Virginia Department of Planning and Budget to conduct an efficiency review of Fairfax County Public Schools, the 13th largest school system in the U.S. The purpose of this project was to conduct an objective review of operational areas within the school division and to determine whether savings could be achieved through best practices in finance, facilities, organization, transportation, service delivery, human resources, technology management, and other noninstructional areas. Our report contained 33 recommendations for improving the efficiency and effectiveness of Fairfax County Public Schools’ operations. We estimated that our recommendations, when implemented, would result in a five-year net savings of $10,840,362. This project was a part of the Virginia School Efficiency Program, for which Gibson has conducted similar efficiency reviews of Stafford County Public Schools, Spotsylvania County Public Schools, Hanover County Public Schools, and Arlington Public Schools. Clark County School District in Nevada is the fifth-largest school system in the United States.They selected Gibson from among six competing firms to conduct an Educational and Operational Efficiency Assessment Study. The $900,000, three-month project involved a student performance analysis, an academic programs and management review, a budget process review, and an operational review. Gibson collected and analyzed over 1,000 documents from Clark County School District and interviewed approximately 260 Clark County School District staff members. We identified 45 recommendations for improvement which we estimated would, if fully implemented, result in annual General Fund net cost reductions of approximately $52 million per year. For this project, we also developed a data dashboard prototype for Clark County School District to use in performance measure tracking. We apply sophisticated statistical methods to empower educational leaders to make policy-relevant decisions. Gibson’s research and evaluation team empowers decision-makers with information essential to making policy-relevant decisions. The ultimate goal for educational evaluation is to help educators and policy-makers gauge the effectiveness of programs, interventions, and initiatives. A thorough program evaluation designed by Gibson will do more than that. We provide timely feedback during a program’s implementation, which will inform scale up, allow for mid-course corrections, or inform key programmatic decisions. This implementation information, in turn, can also help explain why or how desired program outcomes may or may not have been achieved. Analyses of outcomes data (e.g., school district and/or student performance data, attendance, staffing data). How do parents in your district feel about the quality of education their children receive? How do students feel about school safety? Meaningful questions like these require collecting systematic input from a large population of individuals – students, parents, teachers, and school staff. Researchers at Gibson can help organizations with any aspect of survey research, whether it be analyzing data already collected, designing an instrument for an organization to collect its own data, providing training on interpretation of results, or conducting all aspects of a survey project. Our research team includes experts in advanced statistical methods and econometrics who perform extant data analysis for federal, state, and local school districts clients. And we want to do more than emphasize the data- we want to make it meaningful. We specialize in communicating our quantitative results in a way that they are easily understood and readily used for informing program implementation and policy decisions. Gibson researchers use rigorous, evidenced-based statistical methods and are well versed in What Works Clearinghouse (WWC) standards for meeting evidence requirements. Specification of a variety of multivariate models for cross-sectional and panel data, including multivariate methods for continuous and limited outcome variables. Working with extant federal, state, and local data systems and data structures, and in building databases needed to meet the information management and analysis needs of varied organizations. Analysis of qualitative data, including interview data, focus group data, and responses to open-ended survey questions or other narrative written responses. Educational leaders and policy-makers make important decisions every day that affect teaching and learning in their organizations. Our research team can provide training and assistance to enhance an organization’s capacity for collecting data they need, analyzing data they have, and appropriately interpreting results. We can support and grow an organization’s own internal capacity or supplement that capacity. We can also provide one-time or ongoing training to help decision-makers or practitioners have data-driven conversations with staff to bring about positive change. Many of the most important and actionable insights generated from the analysis of education data are obtained from the disaggregation of results by key subgroups. Our research team presents various levels of disaggregation by integrating sophisticated statistical analysis with visually compelling, customized reports. These reports can be used to provide results at any level of disaggregation to show variability on key metrics or differences in perceptions by staff role. For instance, a district-level snapshot of perceptions of key performance measures across schools is valuable for certain audiences, yet this aggregation can mask wide and important variability that exists from school to school, or even within a school. The same is true for objective measures of school and student outcomes, such as student test performance and patterns of postsecondary enrollment and completion. Our research team has developed customized reports for a number of clients for a range of educational outcomes, including district-level reports of results from parent surveys, school-level reports of results from student surveys, and district-level academic performance and teacher credentialing reports for School Improvement Grant (SIG) schools. motivated to build the capacity of our clients. That’s why, before funding expires, you will be equipped to continue a research project that we executed, if desired. We provide detailed information that captures each phase in your research or evaluation project workflow. This documentation serves the dual purpose of providing a roadmap for replicating work in the future and for sharing with other researchers who may encounter common challenges. We also develop manuals that provide statistical programming code along with explanatory annotations that can broaden the audience of researchers and practitioners who can meaningfully contribute to the dialogue surrounding the technical phases of research, and who can then apply the same rules and logic to similar datasets in different programming languages. In collaboration with researchers from the Center for Economic and Social Research at the University of Southern California, Gibson is currently examining the effectiveness of Knowledge in Action (KIA), a project-based learning approach to teaching Advanced Placement (AP) courses. This randomized controlled trial field experiment in 75 schools across five large U.S. school districts is investigating teachers’ KIA implementation and the impacts of KIA on students’ academic performance as measured by AP exam-taking and scores, critical thinking and problem solving skills as measured by the College and Work Readiness Assessment, and intra- and interpersonal skills and civic engagement as measured by a student survey. The Gibson research team also works on various projects funded through the Department of Education. These studies span various states, including Texas, New Mexico, and Virginia, and are conducted in partnership with Regional Education Laboratories. and Math (STEM) courses (while in high school) and fields of study (in college). Advanced high school course-taking patterns across different student groups—particularly historically underserved student groups—and advanced course offerings across different schools. Student performance in low-performing schools with various accountability designations. Kindergarten readiness and psychometric assessment of school readiness measures. Click here to learn more about the Regional Educational Laboratory Southwest. The Gibson research team, along with experts in bilingual/ESL education from American Institutes for Research (AIR), conducted an evaluation of Tyler’s bilingual/ESL program in an effort to identify areas for focused, targeted improvements. Analysis of the districts’ English Language Learner student data (including assessment scores, language proficiency scores, parent denial rates), including examination of performance over time by various sub-groups of interest (e.g., by grade, by school, by ELL status). Examination of the district’s implementation of its bilingual model, and the identification of areas where improvements may have impacts on student outcomes. Various strengths of Tyler’s programming were identified, and recommendations were made for program improvement, particularly in the areas of program model selection and implementation, as well as collaboration and coordination across departments, strategies for improving identification and placement, and ideas for attracting/developing qualified bilingual staff in needed areas. Click here to read an article about the program. Implemented in eight higher education institutions across the state, the CSSP had several goals: increase student completion of courses with traditionally high rates of failure and/or withdrawal, increase completion of degrees or certificates, improve faculty involvement in student success initiatives, and increase student participation in campus activities and events. Institutions that participated implemented early warning data systems, made changes to instructional approaches, increased contact between advisors/counselors and students, and increased faculty involvement in supporting student success. Gibson employed a mixed-method design incorporating interviews and classroom observations to measure implementation, with quantitative analyses examining program outcomes. Results were promising, with CSSP students earning more credits on average than comparison students and demonstrating higher rates of persistence. Results varied by institution. students with an Individualized Education Plan who exited the school system in a given year (to measure post-high school employment and education paths). On an annual basis, Gibson administers surveys to parents of over 30,000 students and to more than 3,000 exited students across the state. We use Rasch scaling methods on the NCSEAM Parent Involvement surveys to calculate results and to provide district-level reports in addition to statewide results. We also provide technical support to school districts in understanding and using results to make targeted improvement efforts. Click here to access a statewide summary report from this project. The AVID for Higher Education (AHE) program is designed to provide students with the supports needed to be successful in college. Our evaluation of the AHE program spanned three years and included an extensive assessment of program implementation. We made a comprehensive analysis of the relationship between program participation and key student metrics (persistence in college, cumulative grade point average, and cumulative credit accrual). The study, which tracked student outcomes for three cohorts of students (fall 2012, fall 2013, and fall 2014), found small, yet statistically significant program effects. Click here to access the full report. The Texas Students Using Curriculum Content to Ensure Sustained Success (SUCCESS) program offers state-funded access to computerized interactive mathematics and reading programs. These programs are provided by two vendors—Istation Reading (Istation) and Think Through Math (TTM)—to all Texas public school students in Grades 3-8. Generally, a positive relationship was observed between the completion of online math lessons and gains on the 2013-14 STAAR® test; however, results were mixed depending upon the program and grade level. We help school systems identify and mitigate risk in all areas of their operations by implementing this program for continuous improvement. Internal audits explore more than weaknesses- they analyze how to make the organization stronger, more effective, and more efficient. They provide assurance that the processes in place are being followed and can provide insight into ways to improve these processes. Gibson’s internal audit services can help school districts save money, increase efficiency, and help ensure secure operations. An internal audit is most often perceived as relating only to accounting or financial matters, but an effective program should be able to address any risk – academic programs, auxiliary operations, administration, technology management, and data quality, among many others. Gibson’s multi-disciplinary team and alliance partners can address risks in virtually any area of a school system. Not meeting student, staff or operational goals? Cash or equipment being stolen? A health or safety incident at your schools? Compliance with federal and state laws and regulations? Internal audits can help school districts address these and other risks by conducting an independent, objective review of virtually any area of district programs or operations. The results can save money, and improve performance, compliance, security, effectiveness, or efficiency. Whether you are a small, mid-sized or large school system, internal audit can help. Several of our clients outsource the entire internal audit function to us. Others use us to supplement their existing internal audit department. Still others contract with us for a single internal audit project. Either way, we can help you implement an internal audit program of continuous improvement for your school system. What is the area of highest risk within your school system? Are these risks being managed effectively? A risk assessment will help you to answer these questions and make sure the internal audit is directed where it can provide the most value. A risk assessment is the first step in an internal audit program, and through this assessment, risk factors are evaluated and scored to determine the highest risk areas in the school system. The highest scores get picked first for audit, with lower risk areas addressed in future years. A risk assessment shows you where you may be most vulnerable, and develops a plan to evaluate these areas in depth. Financial audits are usually what people think of when they think of internal audit. Traditional financial audits include purchasing, warehousing, accounts payable, payroll, activity funds, accounting operations and budgeting. Gibson applies transaction testing, data analytics, and process analysis to identify and evaluate potential problems and control weaknesses. Gibson helps ensure that transactions are executed accurately, efficiently, and in compliance with applicable laws, regulations, and policies. Our team of certified professionals and school finance experts have experience in conducting financial and internal audits, fraud investigations, and other financial reviews in the K-12 market and private sector. In Texas, Gibson provides internal audit services through the Texas Association of School Boards (TASB). In 2011, TASB launched a program to offer internal audit services to Texas school districts, and selected Gibson through a competitive process to provide these services. Gibson is proud to have TASB’s endorsement for this important work, and is seeking similar endorsements in other states. Financial audits can also include fraud investigations. Our audit team has conducted more than 100 fraud investigations, and has testified in more than 50 fraud cases as a financial expert witness. Facilities maintenance, custodial services, transportation, food services, safety and security – these auxiliary operations represent significant investments of school system funds and also have high risks related to student safety, efficiency, and in some cases compliance. Gibson taps several alliance partners that have particular technical expertise in these areas, and combines these resources with our skill sets in auditing, financial and efficiency analysis, process analysis and organizational analysis. The result is a very powerful team that can help improve the efficiency, effectiveness and compliance of these important functions. Are programs reaching their core audience? Are they effectively meeting their objectives? Our project team includes alliance partners that are curriculum experts, as well as program experts to help make sure you are getting the most out of your investment in student learning. Internal audits can also be conducted for specific programs, for example, on special education or Bilingual / ESL programs to help ensure that program operations and services are meeting student needs and in compliance. Are your curriculum and student assessments being implemented consistently and with fidelity? Do classroom walkthrough instruments collect sufficient data to evaluate curriculum or program implementation? Do teacher evaluations look better than student outcomes? Are we effectively using data to identify student needs and corrective actions? Your financial data is subject to an external audit every year, but what about your other data? Is your student attendance data accurate? Do you know how many positions and employees you have? Are students properly coded for proper programs and services? Non-financial information is relied on to make important decisions and in some cases drive funding. Making sure it is accurate ensures that the right decisions are made and your funding is maximized. Our data analytics team can download entire district databases and run queries to determine anomalies in the data. This along with analyzing data entry processes and controls helps ensure the integrity of district data. Conducted as a part of our long-term internal audit agreement with Killeen Independent School District, Gibson conducted an internal audit of the purchasing and accounts payable departments for the district. The audit involved interviews with purchasing department and accounts payable department staff as well as data analytics and testing of transactions to ensure compliance with board policies, administrative regulations, and district operating procedures. The report included tighter controls over competitive bidding and improved procedures for processing purchase orders. As a part of our long-term internal audit agreement with Fort Bend Independent School District, Gibson conducted an audit of the district’s student information systems. Our review covered policies and procedures governing the collection, processing, maintenance, and reporting of student information during the 2013 and 2014 school years. We also reviewed operations and controls related to the district’s primary student information system, and performed data analytics on the entire student database to identify issues and their magnitude. Areas of improvement were identified and recommended in the final report. Conducted as a part of our long-term internal audit agreement with Hays Consolidated Independent School District, this audit focused on the management processes, school-level practices, automated tools, and the accountability mechanisms used to support the academic program at Hays Consolidated Independent School District. We analyzed six major areas of academic management including curriculum implementation fidelity, student data analysis and use, instructional resources and support, teacher observation and evaluation, teacher professional development, and academic program management and decision-making. Our approach involved the analysis and the corroboration of data from multiple sources including district-provided data, teacher surveys, interviews with central office staff, teacher and principal focus group sessions, and classroom observations. Our recommendations included changes to academic program organization structure, decision-making framework, student data analysis, classroom observation protocols, lesson plans, teacher professional development, and procedures through which curriculum implementation is monitored. In conjunction with the Austin Independent School District’s Internal Audit department, Gibson performed a comprehensive risk assessment for Austin Independent School District as part of the pilot phase of the partnership between the Texas Association of School Boards and Gibson. The project included over 40 interviews with Austin Independent School District staff and members of the Board of Trustees. We assisted the Internal Audit department in developing its long-range audit plan and FY 2012-13 audit schedule. Austin Independent School District contracted further with Gibson to help the district transition its internal audit function from its pre-existing narrow focus towards an expanded scope of coverage that included all programmatic and operational areas of the school system. We develop advanced graphical and drill-down analysis tools to improve the transparency of educational organizations and the understanding of complex student, financial, and performance information. Visualizing data is a powerful tool for examining patterns, investigating changes over time, or exploring differences by groups of interest. Patterns, trends and abnormalities that might go undetected in a text-based format (spreadsheet) can be seen more easily with data visualization software. And the ability to drill down to lower levels of detail, selectively – based on the user’s desires – provides a level of transparency that is real, and meaningful. Gibson can do this for you. In simple terms, data visualization is the presentation of data in a pictorial or graphic format. These visualizations can help decision-makers explore information in ways that quickly highlight important patterns, outliers, or commonalities. The data visualization tool puts the power of analysis into the users’ hands. Data and performance measures can be analyzed in various ways, including trend, peer or benchmark analysis. This can be achieved for student, financial, staffing and operational data. Better Communication A data dashboard serves as a highly efficient and effective form of communication for the district, because it promotes a common base of information and language for educators and stakeholders to use. Additionally, it collects and presents information that stakeholders might have difficulty finding or connecting otherwise. Better Accountability and Transparency Through data visualization tools, users can more easily find meaning and relevance in the “sea” of data, and thus meet the growing demand for accountability and transparency in education. Demonstrate Efficiency and Effectiveness Data visualization allows for comparison across multiple datasets. This allows the school district to compare its data to standards and peer data, thus demonstrating the district’s efficiency and effectiveness. Additionally, these tools can help the school systems further develop a conceptual framework for data-informed leadership, than in turn can promote greater efficiency and effectiveness within the school district. For Jefferson County Public Schools (JEFFCO) – the largest school district in Colorado – Gibson performed cross-sectional and longitudinal data analysis on the school system’s employee satisfaction survey data. We analyzed 10 years of employee data to examine differences between employee groups and trends over time for different areas of satisfaction – including constructs such as employee effectiveness, district diversity, supervision, compensation, and benefits. In addition to providing JEFFCO with targeted recommendations to improve employee satisfaction in key areas, we developed an interactive data visualization tool for JEFFCO that enabled leadership to view survey results at the construct level or item level, and to slice mean scores by any of the demographic characteristics available for analysis. Manor Independent School District hired Gibson to assist the district in analyzing its 2015-16 budget. Gibson helped the board to better understand Manor Independent School District’s expenditure and staffing levels and to better answer specific questions about budget line items by developing a budget analysis and data visualization tool. In collaboration with the board, Gibson collected and validated the district’s expenditures and staffing data. Working with the board and senior leadership, we designed and developed a visualization tool that allowed users to analyze expenditure data in the aggregate and on a per student basis. The tool also allowed users to drill down according to every element of the district’s account code structure, including locally assigned codes. Gibson worked with the School District of Lee County on a large-scale community survey, as well as a survey of secondary school students, assessing attitudes and opinions about student assignment approaches, the district’s programs and services quality, expanded program preferences, and parent involvement issues. As a part of that project, Gibson developed an interactive data visualization tool that graphically presented results from the survey, allowing in-depth examination of survey responses based on any demographic characteristic of interest (e.g., ethnicity, gender, and income). With the click of a button users can choose to display survey results by respondent demographics to examine results that interest them. For the Texas Association of School Business Officials, Gibson upgraded a comprehensive statewide student, financial, staffing, and demographic database – called the Financial Analysis and Comparison of Texas Schools (FACTS) – to include data visualization tools accessed through the Internet. 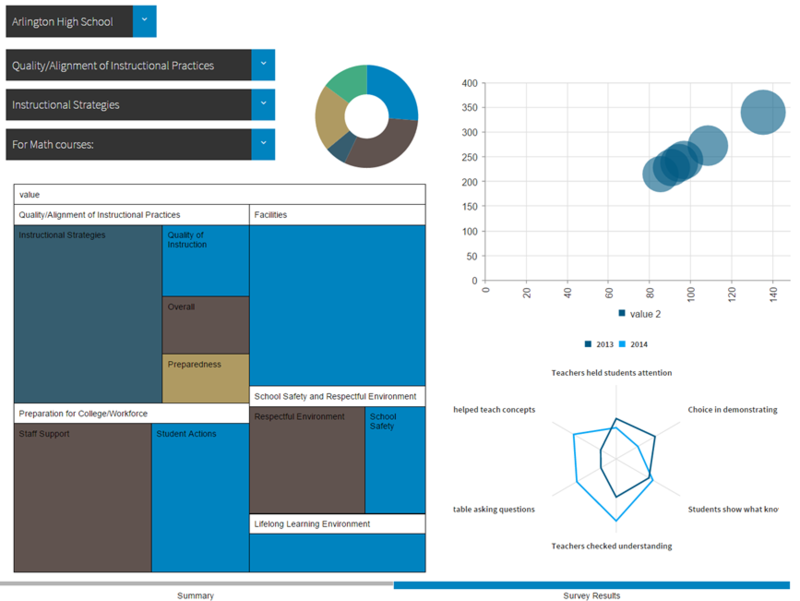 This upgraded business intelligence tool – eFACTS+ – provided multi-dimensional online analytical processing functionality in a fully accessible web-based environment, which helped school systems’ analysts easily analyze performance trends via a researcher friendly interface fit for the casual and power user. In the years following the upgrade, Gibson provided further eFACTS+ enhancements as well as training.